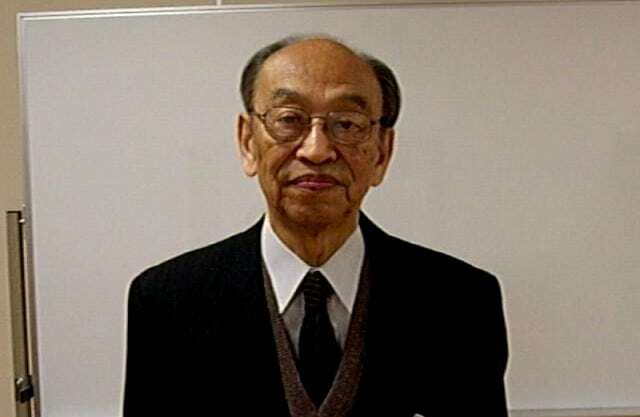 Two days ago one of the most influential logician of the 20th century has passed away, Gaisi Takeuti (竹内 外史). I had the pleasure to meet this excellent man, teacher, writer, thinker several times while he was the president of the Kurt Gödel Society. I don’t want to recall his achievements in mathematical logic, in particular proof theory, because I am not worth to write about such a genius. I want to recall a few personal stories from my own experience. I came into contact with Prof. Takeuti via is famous book Proof Theory, which my then Professor, now colleague and friend Matthias Baaz used for teaching us students proof theory. Together with Shoenfield’s Mathematical Logic these two books became the foundation of my whole logic education. Now again in print, back then the “Proof Theory” was a rare precious. Few prints did remain in the library, and over the years one by one disappeared, until the last copy we had access to was my copy where I had scribbled pages and pages of notes and proofs. Matthias later on used these copies for his lectures, I should have written on the back-side! I remember well my first meeting with Prof. Takeuti: I was on the Conference on Internationalization in 2003 in Tsukuba, long before I moved to Japan. Back then I was just finishing my PhD and without much experience. When I arrived in the hotel, without fail there was a message of Prof. Takeuti inviting me for dinner the following day. We had dinner in a specialty restaurant of his area, together with is lovely wife. I was soo nervous about Japanese manners and stuttered Japanese phrases – just to be stopped by Prof. Takeuti pouring himself a glass of sake and telling me: Relax, and forget the rules and fill your own glass when you want to. I am well aware that this liberal attitude didn’t extend to Japanese colleagues, where he, descendant from a Samurai family, was at times very, extremely strict. The dinner was decided upon already, not easy since I was still strict vegetarian back than (now I would have enjoyed the dinner much more! ), but for the last course we could decide. I remember with a smile how Prof. Takeuti suggested in Japanese various sweets, just to be interrupted by his wife with “No Gaisi, no!”. I asked what is going on and she explained that he wants to order a Japanese sweet for me – I agreed, and that was probably the worst dish I had in Japan. Slippy noodles swimming in a cold broth, to be picked with chopsticks and put into a semi-sweet soja-sauce. I finished it, but it wasn’t good. I should have thought twice when Prof. Takeuti’s wife ordered a normal fruit salad. Scientifically he was simply a genius – and famous for not reading a lot but reinventing everything. One of my research areas, Gödel logics, was reinvented by him as “Intuitionistic Fuzzy Logic” (for an overview see my talk at the Collegium Logicum 2016: Gödel Logics – a short survey). But I want to recall one of my favorite articles of him: “A Conservative Extension of Peano Arithmetic”. This was published as part 2 of Volume 17 of Publications of the Mathematical Society of Japan, retypeset pdf is available here, JSTOR page. Therein he develops classical (real and complex) analysis over Peano’s arithmetic. He shows that any arithmetical theorem proved in analytic number theory is a theorem in Peano’s arithmetic. The proof uses Gentzen’s cut elimination theorem, the center piece of modern proof theory. With Georg Kreisel having passed away in 2015, and now Gaisi Takeuti, we loose two of the greatest, if not the greatest minds in logic. Thank you for this excellent, both personal and scientific obituary. I understood by reading this article that there was a lot of human warmth in him as much as his splendid mathematic talent. I wish I could have seen him too. I’m sorry for your loss.